As you read this, boyfriend and I are cruising around the Caribbean. Depending on what time you read this today, we may be rappelling through waterfalls, sitting on the beach or stuffing ourselves with buffet food. We are on a cruise vacation because I wanted a nice, calm, relaxing break from work. Our past few vacations have been anything but relaxing, with the trekking to far flung foreign lands, managing several different foreign languages and packing in as much sight-seeing as we could. You want to go on a calm vacation, do not go to Bangkok. You want a relaxing vacation, do not go on a trek around Europe. You want to sit still for more than ten minutes, do not go on vacation with boyfriend. This boyfriend of mine has energy for miles. While vacationing on a white sand-ringed island last year, we decided to spend the day at the beach. Snorkels, beach towels and Gatorade in tow, we made our way to a quiet and secluded beach overlooking the neighboring islands. I laid my beach towel out, dropped my sandals in my bag and went to wade in the warm Caribbean water. Having decided that was enough movement for now, I made my way back to our beach towels and realized I was by myself. Boyfriend had wandered off. Figuring he couldn't go too far (I had his shoes), I decided to wait for him by reading a magazine (okay, I was doing logic puzzles. I'm a big old nerd!). I kept hearing rustling noises in the bushes behind me, but we had been hearing that all week. The noise was always birds. A half hour later, boyfriend strolls up the beach from a completely different direction from where I last saw him. When I inquired about where he was, his answer was simple. "I was looking for monkeys!" No, boyfriend isn't crazy. We were on St. Kitts, which is an island with a bountiful monkey population. He didn't find any monkeys on his little tour of the beach bushes and this wasn't his last trip off the beaten path. When offered two options - the easy way - or - the way that requires climbing over rocks and shimmying down perilous ledges - boyfriend will always pick option 2. This is why we are spending the day canyoning, rather than sitting on a beach and baking in the sun. And you know what? I wouldn't have it any other way. Since I'm away this week, I didn't want to leave you feeling sad. I realized there were two things I could do to make my absence a little easier. 2. Throw a giveaway while I'm away! What am I giving away? If you have been following the Candy Month hype on my twitter account, I mentioned giveaways! This is the first of two that will happen this month. (Oh just wait for the second, it will be delicious!) 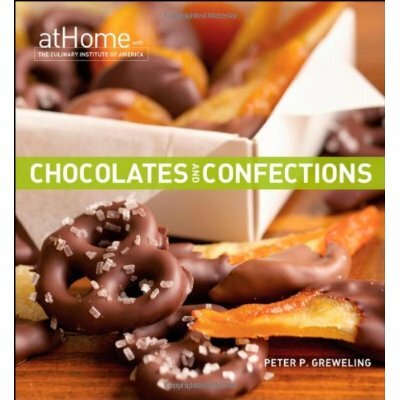 I'm giving away one of my favorite candy cookbooks to one lucky reader! This book gave me so much help and insight in the first few months of Candy Challenge 2011. The Giveaway is now closed! Congratulations to the winner - Amy Marantino! Chocolates and Confections at Home with the Culinary Institute of America! 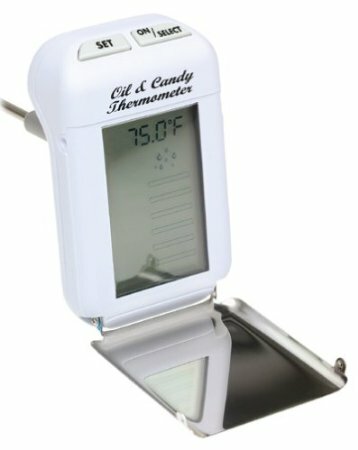 How can you make candy without a thermometer? You'll also receive the very same thermometer that I have come to love. It's digital, has an alarm and two settings (oil & candy). How do you enter? There are so many ways! Do them all and get up to 6 chances to win! 1. Simply comment on this post and tell me which candy recipe was your favorite from Candy Challenge 2011 (you can find the recap on the tab at the top labeled "Candy Collection") Or maybe which candy you would like to try (or have made!). 2. Subscribe/follow/RSS Wilde in the Kitchen so you don't miss out on a single post! Leave me a comment saying that you did! 3. Follow @WildeKitchen on twitter and leave me a comment here saying that you did so! 4. Tweet the following on twitter (or something along these lines!) and let your friends know about our fun giveaway! Leave a comment here saying that you did so! 5. Like Wilde in the Kitchen on facebook and leave me a comment, you know the drill. 6. The last and the most involved way to earn a chance to win... Take part in the Wilde in the Kitchen Relay for Life Bake Sale! Happening on May 17-18, I will be fundraising for Relay for Life and need your help! Up for sale will be several popular Wilde candy treats and I would love to have you all help out! Drop me an e-mail [wildeinthekitchen @ hotmail (dot) com] and let me know if you would be interested in making a baked good/sweet confection for the bake sale! For more information on the bake sale, check out Sundays post. If you already do any of the above, like you already follow me on Twitter, you can leave a comment stating that fact. That's cool, we're already friends! Giveaway is open from April 24, all of the way until Tuesday, May 1st! The Giveaway is now closed, thank you everyone for entering! Disclaimers... This giveaway is open to those in the United States and Canada. Sorry international friends, I'm not good with shipping abroad! I have no affiliation with the publishers or writers of this cookbook, I just think it's awesome and want to share! I hope you saved a little excitement for the marshmallow recipe! These little guys are very chocolaty and mildly malty. I think next time I'll kick up the malt flavor a little more. I decided that they would be extra delicious if coated in chocolate, just be sure your chocolate isn't too hot! (I melted a few mallows!) These will keep well in an air-tight container for about a week. I noticed they turned into little square mold colonies after two weeks. Mold is much less delicious than chocolate. Prepare an 8x8-inch pan by coating lightly with cooking spray. Wipe out most of it with a napkin. In a coffee mug, whisk together water and gelatin for the bloom. Combine ingredients for the malt syrup in the bowl of your stand mixer (or a large bowl, if using a hand mixer) and whisk until gelatin is mixed throughout. Microwave the mug of gelatin on high for 30 seconds and add to the malt syrup. Let the mixer slowly stir as you prepare the marshmallow syrup. Combine all ingredients for the syrup in a 2-quart pot and stir to wet all of the sugar. Clip on thermometer and bring to a boil. Wash down any sugar crystals from the sides with a wet pastry brush. Cook sugar syrup over medium-high heat until it reaches 250 F.
With whisk attachment, turn on your mixer to low and slowly start to add the marshmallow syrup. Once all of the syrup is added, gradually turn the speed up to high. If you are using a stand mixer you might want to put a tea towel or the plastic pouring shield on the bowl to minimize rouge sugar splashes. Whip for 16-18 minutes, or until it is fluffy and shiny. Add vanilla and whip for 60 seconds more. Pour marshmallow batter into the prepared pan and let sit for 4 hours to cure. Lightly coat your work surface with cooking spray. 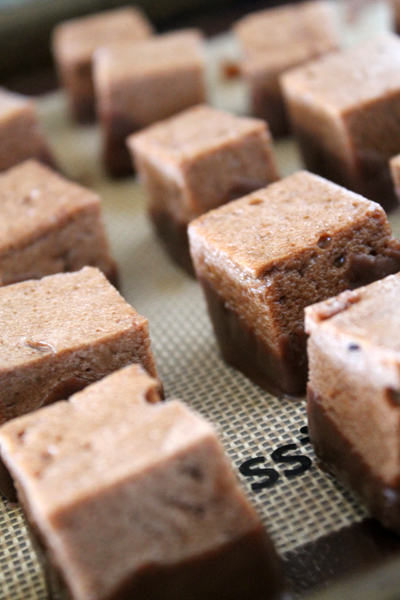 Turn marshmallow slab out onto the surface and cut into 1-inch cube with a big knife. 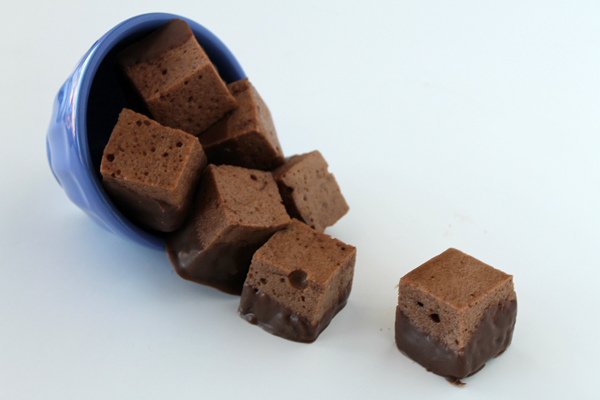 Prepare your chocolate (temper the good stuff or just melt the candy melts) and dip the bottoms of the marshmallows in the chocolate. Let sit to harden on a parchment lined baking sheet. 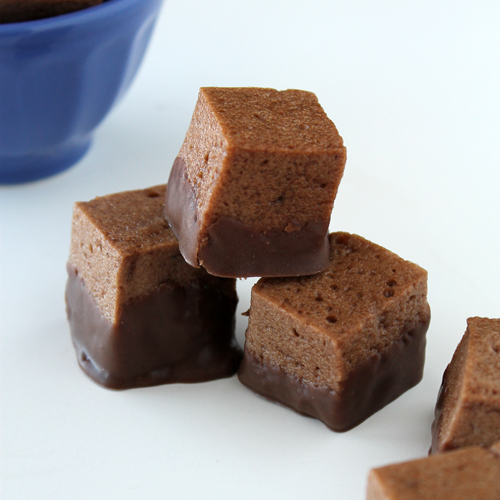 You can coat the tops with a combination of 2 parts powdered sugar, 1 part corn starch & 1 part cocoa powder (sifted together). Or just do as I did, leave them sticky and eat them all!